Moving blindly through a thick fog. That was yesterday. Today, clarity returned and I was much happier with the outcome! Whether it’s exercise or sport, writing or another art, there are times when the motivation and the muse have departed and all that’s left is discipline to drive the day. And a girl’s not going to improve if she only tackles projects when she feel like it, right? Still, I’m not totally convinced the extra effort that those times require is worth it when the project or routine takes three times as long to complete. Numerous moments yesterday I thought to myself maybe I should just close up shop and stop fighting my brain. When all was said and done, I wasn’t even happy with the outcome. Nothing more unsatisfying than creating a dud and spending all day doing it (and then looking around at everything else that didn’t come to fruition)! But maybe it wasn’t for naught after all, as I suppose yesterday’s effort helped guide today’s project. Something must have been stirring behind that fog! And so I present you with the shabby-trendy-edgy-chic style (a card concept I have coined with the latest efforts)! 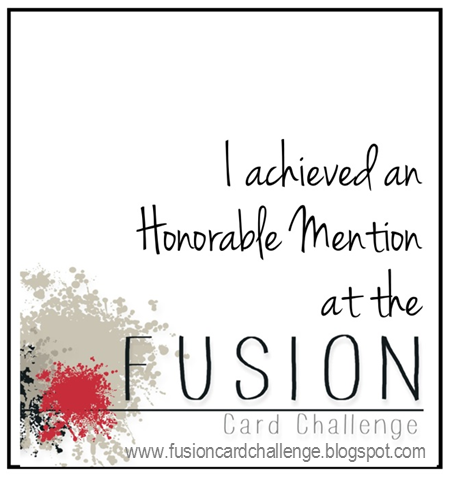 When I saw this week’s challenge over at Fusion, I was totally captivated by the colors– blush/pink with navy, baby blue, and grey–I set about to gather all the papers and objects in the palate. Most of the items for this card (resin frame, digi paper in frame, tag, flower, dymo sentiment) were gathered and put aside as I toiled away on my first attempt; after yesterday, I wasn’t even sure I would have time to see my ideas through for this card. It was Cris G. (see her work over on Flickr) who reminded me I had the blue and ivory floral paper she used in her card (the flipside of which ended up being the unifying background piece for this one). The pink and silver dotted paper is from Seven (Studio Calico) and love the quality of the pink– it has these wonderful purple undertones that work so well with the dark and airy blues. Love that deep blue-black leaf!! Initially I had played around with some papers from the We R Memory Keepers “Love Notes” collection for the front background panel, but none worked. Given the sentiment and the colors, what did work was the paper I have adhered inside as a non-traditional greeting. I love the encouraging sentiments, and figured I could write a message underneath on the card base, or stamp a sentiment on a small piece of vellum and overlay the paper. To be determined! It’s the kind of card that will be headed for the deconstruction pile, where its parts will live on in another, more inspired creation! I was wise enough to know I’d likely be revisioning it, so I used non-permanent glue dots! As a result, it promptly fell apart after a few hours, beginning the process for me (those little birds are heavy!!)! Do you ever do the same with your work? That’s all from me tonight. I hope you savored your extra day this Leap Year! Have a fabulous week and be sure to check back on Thursday, as I have a surprise to unveil! Hey girl – FABulous layers 🙂 So glad you joined in the fun @ FUSION! I do have a small pile of ‘to be reconstructed’ cards. I think we all have days when our card making mojo decides to sleep in, or days when our brains can’t seem to get our lives up to speed. The pink and blue card is amazing. I love every detail you’ve got on this one. So much depth and so many lovely layers. This is just delightful. Love it! I love your layering of panels, frames, blooms, tags and colors! Gorgeous! Beautiful layers!! Thanks so much for playing along with us at Fusion.